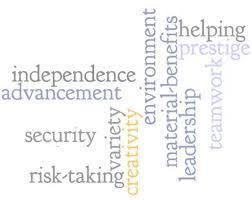 Brock CareerZone Blog: Values are important when considering your career! Values are important when considering your career! Find rewarding work by following a career path that matches your values. When you think about careers that you could see yourself doing because they seem interesting, remember to also think about whether or not those careers fit with your values. For example, if you strongly desire a career where you are recognized for your valued work and value the opportunity to work independently, then you may not enjoy a career where you are constantly monitored and are not individually recognized for a personal project that has great benefit for the success of the company you work for. How can I assess my values? A great assessment tool that can help you identify your values and much more is Type Focus. This tool can help you determine your values, skills and interests, and will match you with careers that compliment your results. There are also many other assessments that you can use, however Type Focus is highly recommended by Career Services and as a Brock University student, you have FREE access; so why not take advantage of it?! Check out Type Focus at Career Zone. Simply log in with your Brock ID.